Nothing is as homey as the smell of an apple pie baking, and this pie looks and tastes like you spent hours in the kitchen! Beat butter and brown sugar in a medium mixing bowl until light and fluffy. Spread onto bottom of a 9-inch pie plate. Top with nuts. 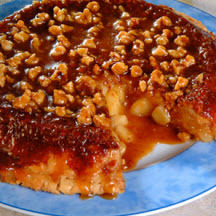 Top with one pastry, being careful not to make holes in pastry with nuts. Trim dough to make even with edge of pan. Combine escalloped apples, granulated sugar, flour and cinnamon in a medium bowl; place over pastry. Place remaining pastry over apple mixture and trim even with edge of pan; prick top crust with the tines of a fork. Seal crust edges by rolling the edges toward center of pie. There should be no crust touching rim of pan. Bake for 50 to 55 minutes. Carefully run knife around edge of plate to loosen pie; invert onto serving plate. Let stand for 2 minutes; remove pan.